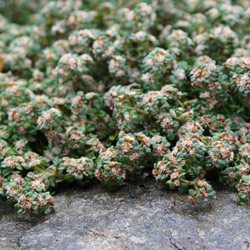 This is a varied species, with plants ranging from low growing to small shrubs, Spyridium parvifolium makes a great border plant, or ground cover when left to flow to the edge of the border. Some forms are prostrate and will reach around 15cm in height much lower growing than others. Look for ‘Spyridium parvifolium prostrate’ perhaps over a flat stone. Small glossy leaves are attractive. Spyridium parvifolium will grow in full sun to part shade and forms a dense ground cover over time. As a shrub it can reach 2m with deep green foliage with dusty white tips. Small flowers in autumn are perfumed. A moist we ll drained soil, or perhaps in a container Spyridium parvifolium has a lot to offer and is underused in landscaping. Also known as ‘Dusty Miller’ and found widely through Victoria and South Australia also in New south Wales, Tasmania and South Australia.. The taller form is prevelent in Victoria, the lower growing form is from New South Wales. It is the lower growing form that the landscaper Edna Walling, found so useful in plantings. Excellent in a cottage garden and equally at home growing in a container where it can be allowed to gracefully flow over the edges. Also useful in coastal plantings where it seems to cope well with conditions. Plants grow well in full sun to part shade, a little moisture in summer, but a well drained soil is essential. Soil – Best in a humus rich well drained soil.